When I was a kid, we always went over to Grandma Mayer’s home for holidays. Auntie DD would have been preparing for days, and always made a big spread-turkey and stuffing, roast beef, ham, gravies, mashed potatoes, salads and desserts of all kinds. Grandma had eight children and many either lived in Havre or a short distance away (relative to Montana terms), and some of them had children and grandchildren. My brothers and I were closer in age to our second cousins than to our first cousins, so we palled around with them instead of the adults. They weren’t fun. When it came time to eat, the adults got to eat off Grandma’s fine china; we kids got her everyday dishes. I’ve seen a lot of dishes in my time, and these rank as one of the least attractive. A chunky plaid of green and brown on an off-white earthenware, straight out of the 60s. They saw all kids of food, including Grandpa’s favorite breakfast of overcooked bacon, eggs fried in bacon grease and toast. However, these were the dishes that held more sentiment to me than Grandma’s fine china. When Grandma died, my aunts held a rummage sale and unbeknownst to me, the set of dishes were sold. Over time, memories of these dishes took over, and I started collecting pieces here and there to re-create my youth. A few years ago, the Havre Daily News asked readers to submit their holiday memories. I wrote of those “ugly dishes” and how I wished I could have a set of them. A reader heard me and took pity on me. She called and said she had a set of those dishes and that no one in her family liked them and I could have those ugly things if I wanted them. Of course I jumped on that one! These dishes, although not the originals, have a special place in my heart. I used them for a private dinner party a couple of years ago, and believe it or not, my guests loved them, too! Special thanks to Millie Pester for giving me her set of plaid dishes. They are by Stetson China Company. They rest on rattan chargers from Pier 1 Imports. Flatware is Log Cabin by Gibson found at Herberger’s. The alternating green and brown glass goblets are recent vintage by Anchor Hocking and match the plaid colors perfectly (Walmart). The clear crystal goblets are from West Germany (thrift store). The ivory napkins are part of a set I call the “Hauge set”, because I worked for the late Lane Hauge in his law office and he gave me a gift certificate for Christmas one year. I didn’t have any table linens for entertaining, so I bought a set at Kmart, thus the “Hauge set”. The wood napkin rings were found at a thrift store. The simple centerpiece is a cut glass compote made in Western Germany (the label is still on it) flanked by two glass crystal baskets, all thrift store finds. 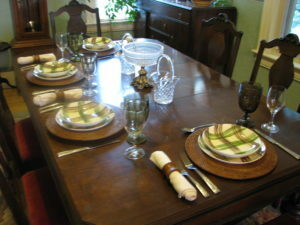 Grandma Mayer’s Plaid Dishes, full of wonderful, warm memories for me of happy family times!